Japan has released the BOJ Core CPI y/y and the US will publish Richmond Manufacturing Index, CB Consumer Confidence, S&P/CS Composite-20 HPI y/y, Prelim Wholesale Inventories m/m and Goods Trade Balance. 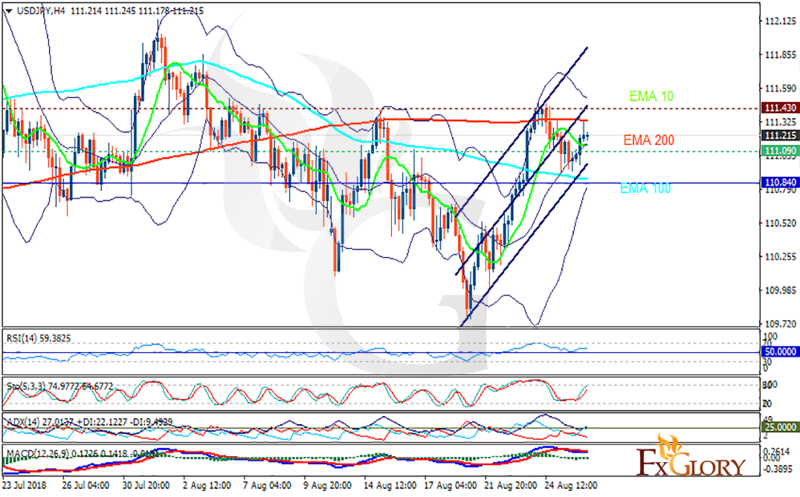 The support rests at 111.090 with resistance at 111.430 which both lines are above the weekly pivot point at 110.84. The EMA of 10 is moving horizontally in the ascendant channel and it is below the EMA of 200 and above the EMA of 100. The RSI is falling towards the 50 level, the Stochastic is moving in high ranges and the MACD line is below the signal line in the negative territory. The ADX is showing buy signal. While considering pullbacks on the way, USDJPY may probably grow towards the upper Bollinger band at 111.5.